The wood fired pizza oven has become a lot more popular in recent years because of the high quality, authentic pizzas that can be made by almost anyone. 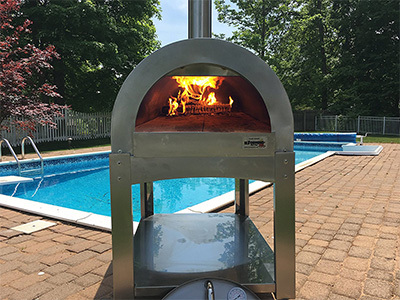 This trend has seen many companies and start ups create their very own pizza ovens, whether it be gas pizza ovens or the more traditional wood fired pizza oven. My family is also part of the craze, building our own (maybe a little over the top) that has room for around 10 pizzas at once. One of our first pizzas on the shelf of our homemade pizza oven. There’s nothing better than hosting a pizza party for all your friends and family and dishing up plate after plate of mouth watering pizza. This guide will take you through everything you need to know about pizza ovens and will review some of the best pizza ovens available today. 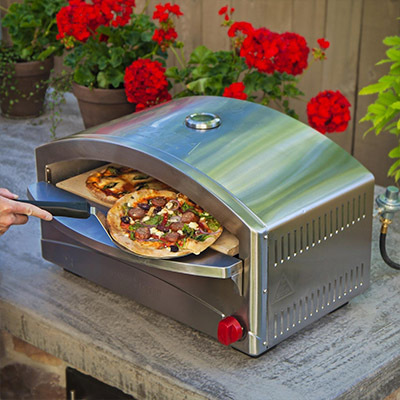 We hope our guide helps you to buy the perfect pizza oven to add to your outdoor kitchen. 1.3 How does a Pizza Oven work? There are generally two types of pizza oven, the traditional wood fired pizza oven and the more recent gas fired pizza oven. Both have pros and cons, but they will certainly take your pizzas to the next level. The wood fired oven is the classic pizza oven that has been used in Italy and around the world for years. This is the ultimate way to cook your pizza and if you can shell out for one of the top of the range brick pizza ovens then you will never go back to any other type of pizza again. The best part of these is the taste, they will be unmatched. A pizza oven can also make a stunning feature to your garden that will likely be a major talking point for anyone that comes around. We also really enjoy the process of starting the fire and tending to it, whilst trying to maintain the ideal pizza oven temperature. This of course can also be seen as the biggest down side to a wood fired oven and many people will want to simply fire it up and start cooking as soon as possible. This is where the gas pizza oven comes in. A gas pizza oven will usually be a smaller oven that is heated by propane gas. The shell of the oven will be highly insulated and will usually be made of stone or ceramic to retain as much heat as possible. Whilst still getting a great tasting pizza, you waver most of the hassle that comes with a wood fired pizza oven when using gas. There are no ashes to clean up (or get in your food), there is usually a much lower set up time and there is a greater ease and consistency when cooking. Having said that, we’ve found that the taste of the pizza is just lacking that authentic edge despite both types of oven working in roughly the same way. 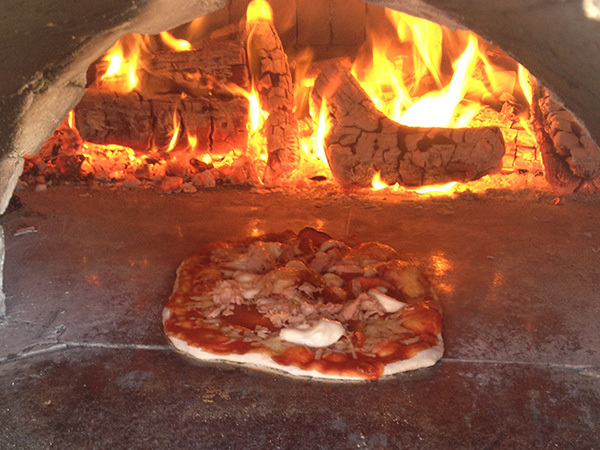 A photo of a pizza cooking in our homemade wood fired pizza oven. How does a Pizza Oven work? The general idea is that there is a stone base that the pizza is placed on. The oven is heated up to incredibly high temperatures (over 900°F (480°C)) which makes the stone base hot enough to give that classic crispy pizza base and crust. As the rest of the oven is also at such high temperatures, the toppings are cooked in no time and the perfect pizza is ready to eat, sometimes within as little as 60 seconds. The difference between pizza ovens is how they are heated. Some use gas to power a flame that directly heats the stone, some use wood pellets in the same way, but the traditional way (and we think the best) is to light the fire in the oven, on the same base as the pizza will be cooked on. Then when the oven is up to optimal temperature the fire or embers are pushed to the side and the scorching hot base is ready to cook on. These different features come at different costs, so we’ve broken down the list into chunks based on the cost of the oven. 250 pizzas from one tank of fuel. 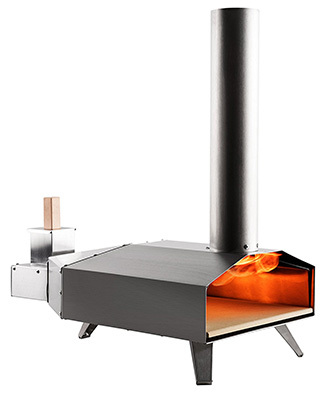 The PizzaQue from Pizzacraft is your standard low budget single pizza gas pizza oven. It uses a 20lb propane tank as fuel and can cook a pizza up to 14” in diameter. It’s fairly easy to assemble out of the box and pre heats in 15 minutes. The build quality is fairly good for a budget pizza oven as it’s casing is fully made from steel and the pizza stone is made from cordierite which is a standard now used in most pizza ovens. Pizzas are generally fully cooked in around 6 minutes. One of the positives of buying a small gas powered pizza oven is that it is very portable. It’s perfect for camping, tailgating or any adventure where you might be tired of campfire cooking and the PizzaQue boasts a whopping 250 pizzas from one tank of fuel. If you’re looking for a good value, basic gas pizza oven then the PizzaQue is the one to choose. It’s quick and convenient and produces pizzas that will give the more expensive options a run for their money. In our tests, all the pizzas took longer than the manufacturer claim of 6 minutes to cook as the oven only got to around 550°F (288°C). This wasn’t much of a problem as the oven was being used for just two people at the time. Whilst it’s lacking some features and the quality of some of the more expensive models, this is a fantastic option for anyone looking for an easy and cheap pizza oven. Extras Great design and looks gorgeous. Fully portable and comes with a carry case. Build in thermometer to keep a close eye on the pizza oven temperature. The BakerStone Pizza Oven Box is a different take on the budget pizza oven. 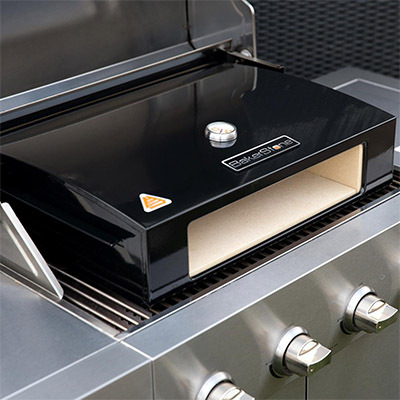 What it is, is an enamelled steel box that you place on your pre-existing grill. The grill heats the pizza oven box and then that cooks the pizza. It’s large enough to be able to cook a range of food, from pizzas to bread and can also roast meats and vegetables. 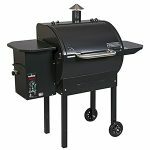 You will need at least a 3 burner grill to use this and ideally have it be a gas grill to be able to regulate the heat better. 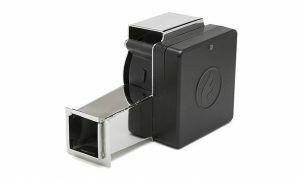 It’ll work on charcoal just as well though as the design and build quality make the heat distribution very even. If you already have a good quality 3 burner (or more) grill then the BakerStone Pizza Oven Box is a great alternative to a standard pizza oven. It can cook great tasting pizzas quickly and easily and is portable so is easy to take around friends and family to let them enjoy it as well. It does require a bit of work to clean, needs to be assembled and the pizzas have to be regurlarly turned as the back heats up a lot quicker than the front but considering the price of this pizza oven box, we don’t think those are major downsides at all. We would definitely recommend you try this if you’re not looking to buy a dedicated pizza oven. Extras Cook two pizzas at once. Micro-adjust valves give you maximum control over pizza oven temperature. Check out our full review of the Camp Chef Italia Artisan Pizza Oven for a more in depth look. The first in our list of mid budget pizza ovens starts with the Camp Chef Italia Artisan Pizza Oven. It’s a gas powered, stainless steel pizza oven that can cook pizzas up to 12” in diameter, or two 10” pizzas at once. It claims to be able to reproduce the artisan brick oven pizzas, and we think that that claim is actually pretty accurate. It uses double walled construction which helps with insulation and can get the pizza oven up to temperatures of around 700°F (371°C) which does help it give the pizzas the brick oven feel. The Camp Chef Italia Artisan Pizza Oven produces great quality pizza that is almost undistinguishable from genuine wood fired brick pizza ovens. It’s assembly is fairly straight forward and produces very high temperatures to make cooking a breeze. It only just fits a 12” pizza, but has the option to do two 10” pizzas at once which might be exactly what you’re looking for. The heat distribution, like with many of the cheaper pizza ovens is a little uneven because of the front of the oven is a large gap. But for the price of this oven you’re not going to get much better pizzas. Next we’ll look at the Blackstone Outdoor Pizza Oven which is very similar to this but can cook bigger pizzas. Either will work and we’d recommend both but if you want bigger pizzas and a generally bigger oven than this, then we’d recommend the Blackstone. If you’re happy for smaller pizzas then the Camp Chef Artisan Pizza Oven is the way to go! 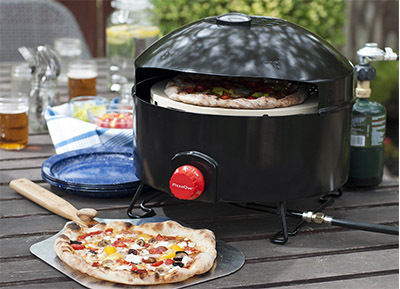 Take a look at our full Blackstone Pizza Oven review here. 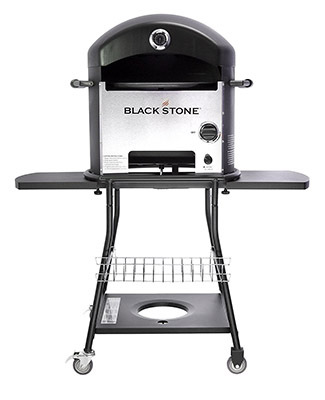 A lot like the Camp Chef Artisan Pizza Oven, the Blackstone Outdoor Pizza Oven is a mid range, gas powered pizza oven. It differs in the fact that this is generally a bit more expensive but can cook bigger pizzas, up to 16” in size. It also has a nifty little feature where it has a revolving base plate to ensure reliable brick oven results. And just like the Camp Chef Artisan Pizza Oven it produces fantastic results that taste basically as good as genuine brick oven pizzas. The Blackstone Outdoor Pizza Oven really does do a great job at cooking fantastic pizzas, the results are some of the best we’ve tasted. There have been reports of a few problems with the model itself, though. Firstly, it needs an additional bearing to help the rotation of the base plate. This can be bought here. 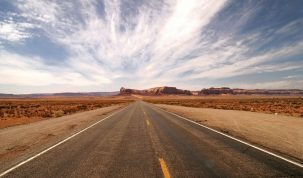 Whilst this isn’t a huge deal, and some people have had success without it, it’s another factor to consider when buying. There have also been reports of the assembly being tricky and people having problems with the igniter switch. All of these issues have been quickly dealt with by Blackstone but they still exist. Our personal experience was flawless but we didn’t have to assemble it. Having said all of this, it’s a great oven to cook on and produces fantastic results. If you’re looking for a larger oven that produces brick oven pizza results then the Blackstone Outdoor Pizza Oven is a great contender. Extras The oven is very deep in comparison to anything mentioned before, meaning that the heat distribution is a lot more even than anything shown so far. Take a look at our full Uuni 3 Review here. The Uuni 3 is the first wood fired pizza oven on the list. It uses fast burning, high energy wood pellets that can get the stainless steel oven up to a temperature of around 900°F (480°C) in just 10 minutes! It’s highly insulated shell maintains the heat and manages to cook up fantastic pizzas in as little as 60 seconds! The quality of the pizza is usually fantastic, the only complaint is that sometimes the roof can build up a little soot which has to be dealt with. If you’re looking for a genuine outdoor wood fired pizza oven that can cook quality, brick oven pizzas in a couple of minutes then the Uuni 3 is a great choice to go with. It’s small enough and light enough to set up and take down in moments and the wood pellet system is as easy as it can get. The slight problems come from a lack of consistency in the cooking, but this is a problem with most wood fired ovens and we think it helps add a little character to the food. That said, if you’re look for practicality over anything else then maybe a gas oven would suit you best. If you want great tasting, authentic wood fired pizza at a relatively low cost, then buy the Uuni. Uuni have recently released a new pizza oven, the Uuni Pro. Check out our Uuni Pro review here. Pellets aren’t just used in pizza ovens. They can also be used in BBQ smokers. 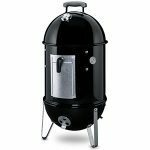 Check out our complete guide to the best pellet smokers. Extras Looks incredible and will become the center point of your garden. Cook multiple pizzas at once. 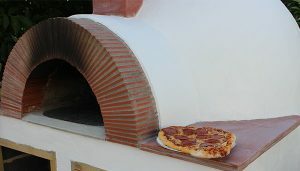 Made in Portugal by PRC Ceramica, their Outdoor Pizza Oven is one of the best you can buy. It is handmade from firebricks and ceramic fibre insulation meaning that it can get incredibly hot. The cooking area inside has a huge 31.5” diameter and the door is 20” meaning you can cook several very large pizzas at once. This is the first genuine brick pizza oven on the list that houses the fire completely inside the dome, meaning you’ll be getting the most authentic artesian pizzas possible. Not only will the pizzas be incredible but the oven itself looks stunning and would make a brilliant central talking point in any garden. There are obviously some downsides to this, firstly, it’s huge. It can cook a lot of pizzas simultaneously but will obviously take up a lot of space. 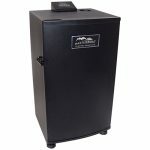 The fact that it’s wood burning means that you’ll have a lot more hassle than the simple gas or wood pellet options. You’ll have to constantly tend to the fire, keeping it around the ideal temperature. For this you’ll (ideally) need a digital thermometer and you’ll need a quality long handled pizza peel and ash brush. But this is all part of the experience, and is definitely worth the money. My family has a large homemade pizza oven in our back yard and I can honestly say that it was the best addition to the house we’ve ever made. We’ve hosted so many pizza parties and it’s always a central talking point with people being blown away by the speed, efficiency and taste of the pizzas produced. If you have the money and want a central feature for your garden that also cooks some of the best pizzas possible then PRC Ceramica’s Outdoor Pizza Oven is one of the best wood fired pizza ovens you can buy. Extras Cook multiple pizzas at once. Built in ash tray for maximum ease of cleaning. If you don’t want to spend as much as the PRC and don’t care so much for looks but want a bit more practicality than the PRC model, then the ilFornino Basic Wood Fired Pizza Oven is a great contender. It’s build from Grade 430 stainless steel, with a double wall and insulation layer style construction. The floor is made from six medium density firebricks and is all mounted on wheels for portability. There are also some nice quality of life design decisions included, such as the built in ash tray, the bottom shelf and the wheels for transport. The opening is around 24” and several pizzas can be cooked at once with ease. It takes a little time to get up to temperature but when it is it can cook pizzas in around a minute. 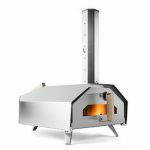 If you’re looking for a practical, high end outdoor wood fired pizza oven that can produce many top quality pizzas in very quick succession then this might be the pizza oven for you. ilFornino have a range of ovens, with this being the cheapest and most basic. The upgraded models feature extra practicality through additional shelves, better build quality with additional insulation and higher quality steel and firebricks. They also feature bigger cooking areas and faster heating and cooking times. These are perfect for professionals and enthusiastic amateurs alike, you’ll be getting amazing pizzas quickly, efficiently and easily with any of the ilFornino Series. If you’re not ready to take the step to a full fledged pizza oven, then the next best thing is to use a pizza stone. We look at the best pizza stones here. Whilst pizza ovens are fairly versatile themselves, especially the high-end models, they don’t quite match the versatility of a Kamado grill. 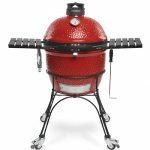 A Kamado grill is generally a ceramic dome shaped oven that is based on a design that dates back to early civilizations. 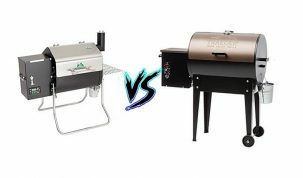 Modern Kamados have been adapted and refined to make great all in one grill combos for your back yard. They come with a lot of accessories, including specific pizza stones made especially for Kamados. These transform the Kamados into brilliant little pizza ovens. 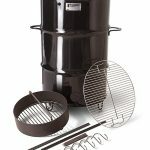 For more information head over to our Best Kamado Grills page, where we take an in depth look at the best Kamados available today. Any pizza oven, whether it be a huge wood-fired brick pizza oven or a small gas oven, will completely change the state of your outdoor kitchen. With any outdoor pizza oven there is a learning curve and through practice and picking up a few quick tips and tricks you’ll be soon on your way to producing the best brick oven pizzas ever. Our top tip for making pizzas is to keep the base thin and go light on the toppings, especially the sauce. A thin base will cook better in a pizza oven and fewer toppings will make sliding the pizza on and off the peel much easier. We’ve taken a look at some of the best outdoor cooking books, some of which take you through everything you need to know about wood fired ovens. 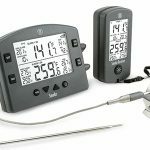 One of the main things to remember with cooking outdoors, whether it be campfire cooking, BBQ smoking or wood fire ovens, is that the temperature is very important. 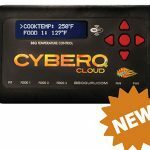 You can produce fine quality food without ever knowing the temperature, but if you want to produce high quality food consistently then we recommend paying close attention to the temperature of whatever it is you’re cooking on. 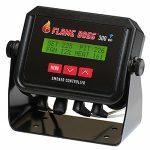 The oven floor in any outdoor pizza oven is not the same temperature as the rest of the oven that is read on most of the in-built thermometers. We’d suggest a thermal temperature gun to ensure that the stone is the optimal heat for the type of pizza you desire. 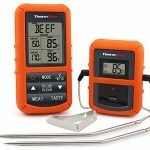 We break down the best infrared thermometers available in a quick and easy to digest guide. For a better look at the accessories available for pizza ovens check out our quick guide to the essential pizza oven accessories. If there’s anything you think we missed or would like us to add then please contact us or leave a comment. My wife and I love making food at our home, and I think that being able to get a wood pellet pizza oven would be something that we’d love! I’m glad that you talked about being able to have pizza cooked in as little as 60 seconds, which sounds amazing to me. I’m going to have to look into some different pizza ovens that we could use, and figure out what our best option would be to have on our patio! To cook a pizza in 90 seconds you need around 700 F that you can only achieve in a wood-fired oven. I love wood-fired oven, it cooks pizza faster and healthy. the BakerStone O-AHXXX-O-000 Pizza Oven Box. I must try it next time. Right now I am also using a portable pizza oven but I am looking for a new one that heats up and cook pizza fast. What type of wood? We don’t want treated wood. Can you buy the right wood from someone like Lowes? 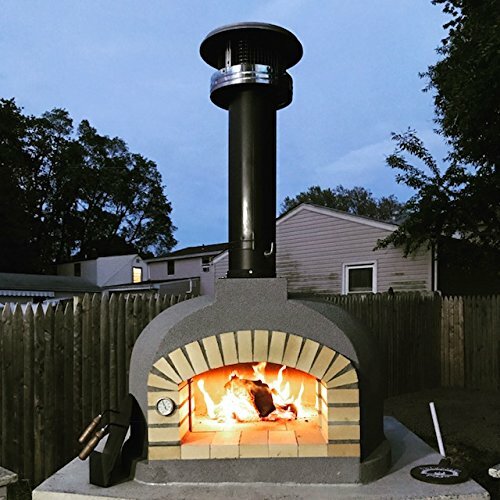 I have the ilFornino wood fired oven at my home in my backyard and I want to tell you that I have the product from an year now and it has performed really well. I’ve tried many pizza recipes till now and it has never disappointed till now, everytime it bakes a unique masterpiece.